Nicky Dou - Search for Properties in Northwest Arkansas - Thinking about selling your home in Bentonville, AR? We are experts in real estate in Northwest Arkansas and will guide you through the entire process of selling your property from listing to sale. Our marketing plans assure your property maximum exposure and we pride ourselves on personal service. 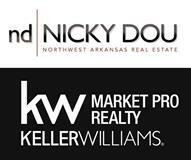 NICKY DOU is the #1 REALTOR IN NORTHWEST ARKANSAS. Nicky specializes in getting homes SOLD quickly and for top value. I am a featured members of Active Rain and my BLOG will have a nice write-up about your home which also helps the placement in the search engines drastically. I can usually get your home on the top of all of the search engines including GOOGLE with 24 hours after posting it on the multiple sites that we place our listings on. You can also Google "Best Listing Agent in Arkansas" and find me... this is the power of the blog platform that I use and I try to get my listings seen FIRST and in their best light... I invest heavily in online marketing as over 93% of buyers go online first and many choose the homes they want to see before even contacting a Realtor. My Youtube page is http://www.Youtube.com/nickydou if you would like to check out some of the videos... and I also post to Pinterest, Facebook, etc. My Facebook business page is www.Facebook.com/NorthwestArkansasRealEstate. We also are also featured on Zillow. Point is: No other Realtor in NWA does more marketing for your listing than I do. I try to get your home sold for top dollar and in the least amount of time. I ranked #1 individual agent in all of NWA in 2014. I have a full time licensed assistant, Jerilyn and my husband, Jerry is also a Realtor (he ranked #56).